Government Whip and chairman of Public Accounts Committee Ashneel Sudhakar at Parliament on September 14, 2017.Photo:Vilimoni Vaganalau. 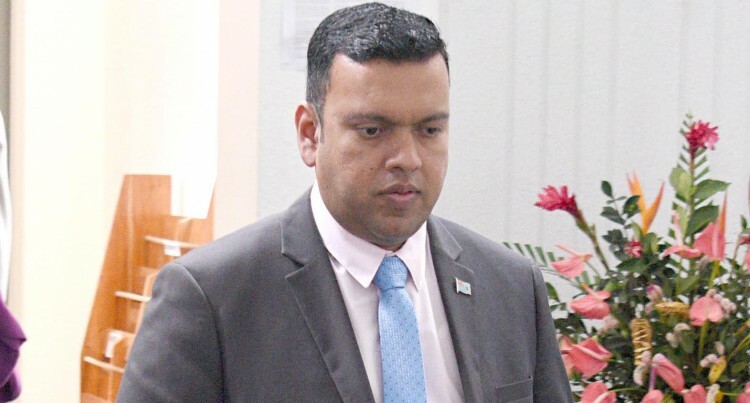 It was FijiFirst parliamentarian Ashneel Sudhakar’s turn to skewer the Opposition by pointing out the numerous contradicting statements Opposition members delivered since Parliament sat from Monday. He likened SODELPA to a bad soccer team, one which had too many coaches and not a clue where they were headed. On the one hand was Semesa Karavaki who calls climate change a hoax. Then there was Viliame Gavoka and the Leader of Opposition who say Climate Change is real and we must act. Ratu Naiqama Lalabalavu who said politics in Fiji will continue to be race based while Aseri Radrodro agreed that politics should be on policies and not on race and religion. “Then we have Hon. Leader of Opposition who on the one hand says that the indigenous population is poor and needs support but on the other hand is against equal distribution of lease money. She doesn’t want to share her wealth. You are robbing the very people you profess to protect. “You want to bring back the Great Council of Chiefs but what about the rights of the common iTaukei brothers and sisters who can’t even sit in the GCC? You don’t want equal distribution of land lease money but still talk about poverty and equal rights of the iTaukei. Among all the nonsensical ideas I have heard from SODELPA this ranks somewhere in the middle!” he lambasted. And, he did not stop there. He pointed out the irrationality behind some of the comments made by Mr Karavaki. “But the height of absurdity has to come from the Talatala himself. Hon. Karavaki suggests that climate change is not real and if we amend the Constitution and include the word of God in it then we should be spared from the effects of climate change such as hurricanes. “If putting the word God in the constitution will stop natural disasters like hurricanes, earthquakes or droughts we just might consider it. However, that does not seem to be right. “Among all the ludicrous ideas we have heard from the Opposition this one ranks in the top 10,” he said. “So please leave God alone for God’s sake!” he implored SODELPA members.